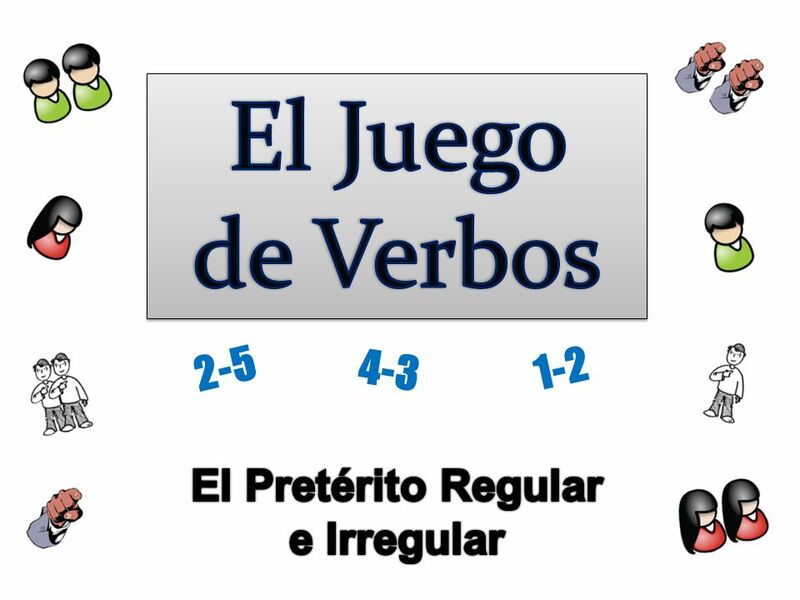 El Juego de Verbos 2-5 4-3 1-2 El Pretérito Regular e Irregular. This is a great activity to get students writing sentences with correct verb forms that move them towards more complex sentences. 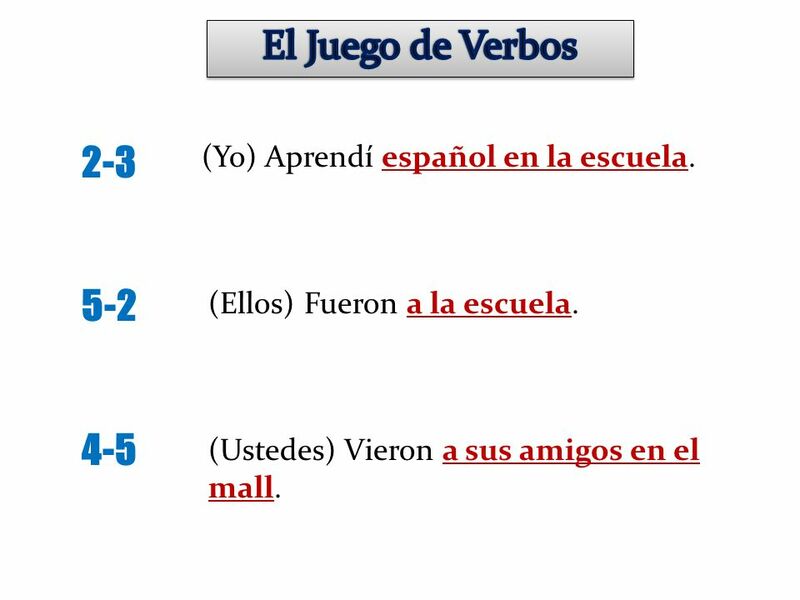 Begin the activity by reviewing the verb forms that students will use in the activity. 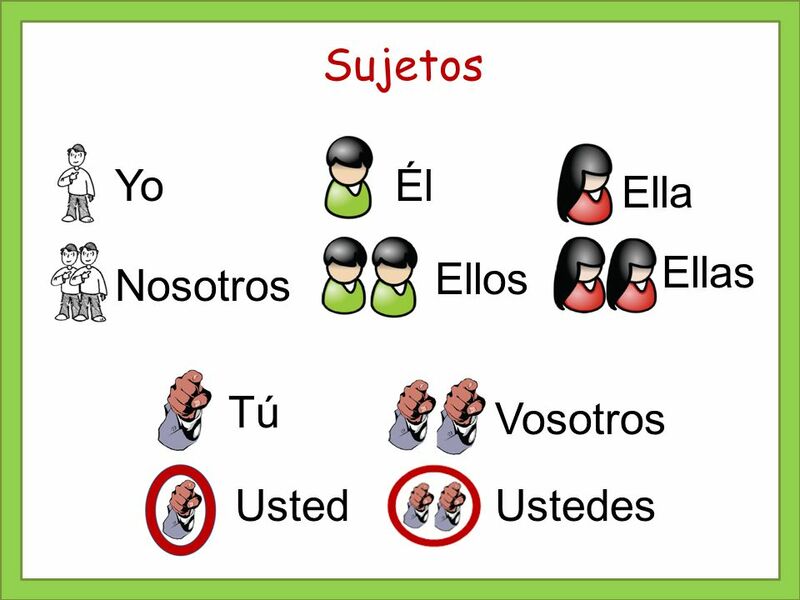 Present the subject pronoun/picture slide so that students are familiar with the pictures. 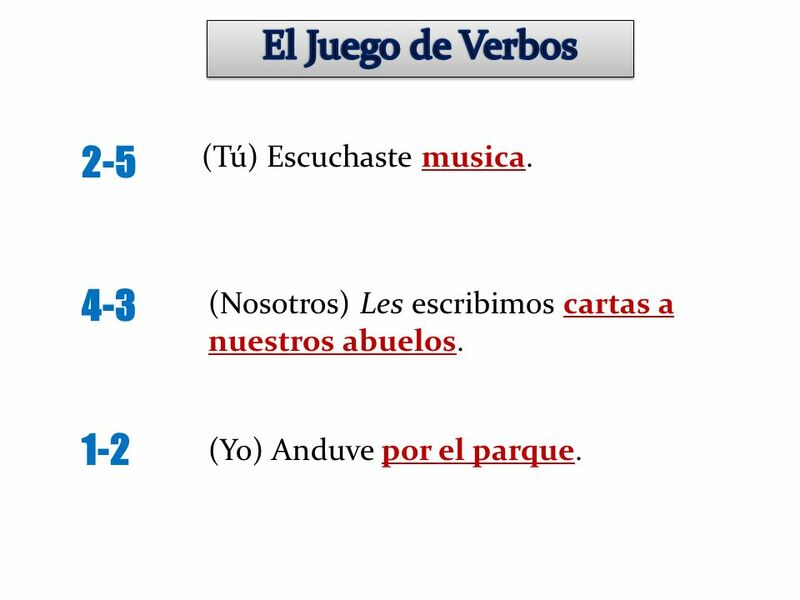 Begin each activity with a single click on each slide that will reveal the verbs (infinitives) and one or two question words. At this point students see six subjects and six infinitives, each numbered 1 through 6. A second click reveals three number combinations. The first number is the subject and the second number is the verb. 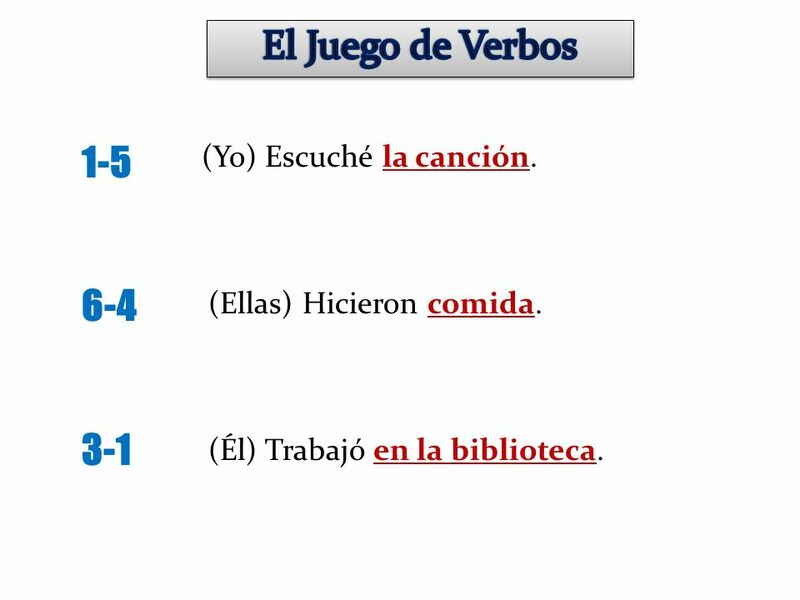 Students then have one minute (the triangle disappears to show time passing) to write three sentences that include the subject, the correct form of the verb and the additional information based on the question word(s). When one minute has passed the verbs are covered. The next screen shows the three sentences that students should have written so that they can check their work. The second half of the sentence is an example as students will have different endings. 8 El Juego de Verbos 2-5 4-3 1-2 (Tú) Escuchaste musica. (Nosotros) Les escribimos cartas a nuestros abuelos. (Yo) Anduve por el parque. 10 El Juego de Verbos 3-6 6-1 5-4 (Él) Puso la goma en su mochila. (Ellas) Trabajaron en la ciudad. (Usted) Hizo su tarea. 12 El Juego de Verbos 1-5 6-4 3-1 (Yo) Escuché la canción. (Ellas) Hicieron comida. (Él) Trabajó en la biblioteca. 14 El Juego de Verbos 2-3 5-2 4-5 (Yo) Aprendí español en la escuela. (Ellos) Fueron a la escuela. (Ustedes) Vieron a sus amigos en el mall. 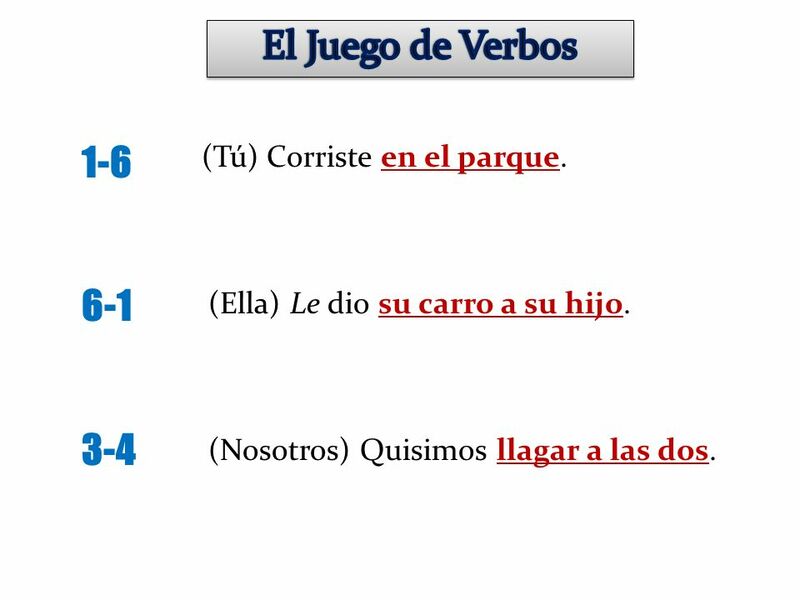 16 El Juego de Verbos 1-6 6-1 3-4 (Tú) Corriste en el parque. (Ella) Le dio su carro a su hijo. (Nosotros) Quisimos llagar a las dos. 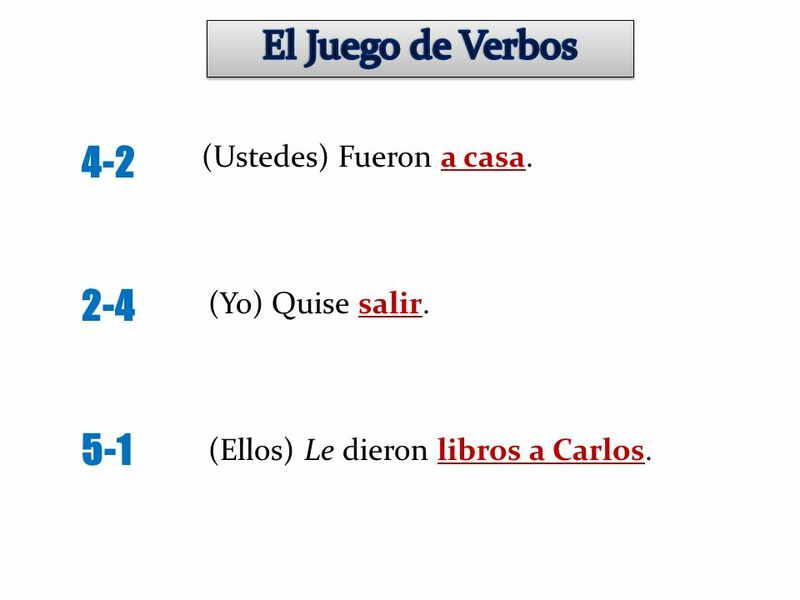 18 El Juego de Verbos 4-2 2-4 5-1 (Ustedes) Fueron a casa. (Yo) Quise salir. (Ellos) Le dieron libros a Carlos. 19 El Juego de Verbos Sujeto Verbo 1. 2. 3. 4. 5. 6. 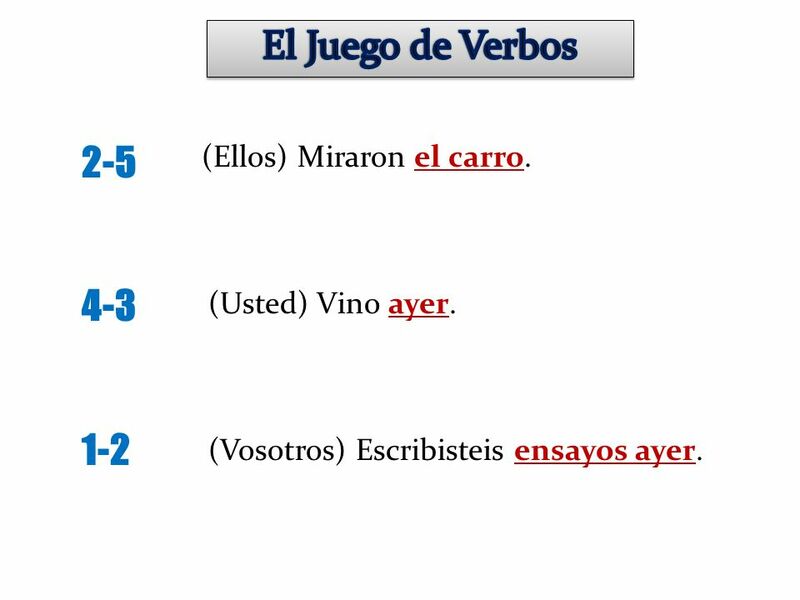 20 El Juego de Verbos 2-5 4-3 1-2 (Ellos) Miraron el carro. (Usted) Vino ayer. (Vosotros) Escribisteis ensayos ayer. 21 El Juego de Verbos Sujeto Verbo 1. 2. 3. 4. 5. 6. 22 El Juego de Verbos 3-6 6-1 5-4 (Nosotros) Comimos pan. (Yo) Les dije “hola” a mis amigos. (Ella) Vivió con su hermana. 23 El Juego de Verbos Sujeto Verbo 1. 2. 3. 4. 5. 6. 24 El Juego de los Verbos 1-5 6-4 3-1 (Vosotros) Mirasteis la pintura. (Yo) Viví con mi familia. (Nosotros) Le decimos la respuesta al maestro. Descargar ppt "El Juego de Verbos 2-5 4-3 1-2 El Pretérito Regular e Irregular." Los Verbos en AR La Forma Correcta. 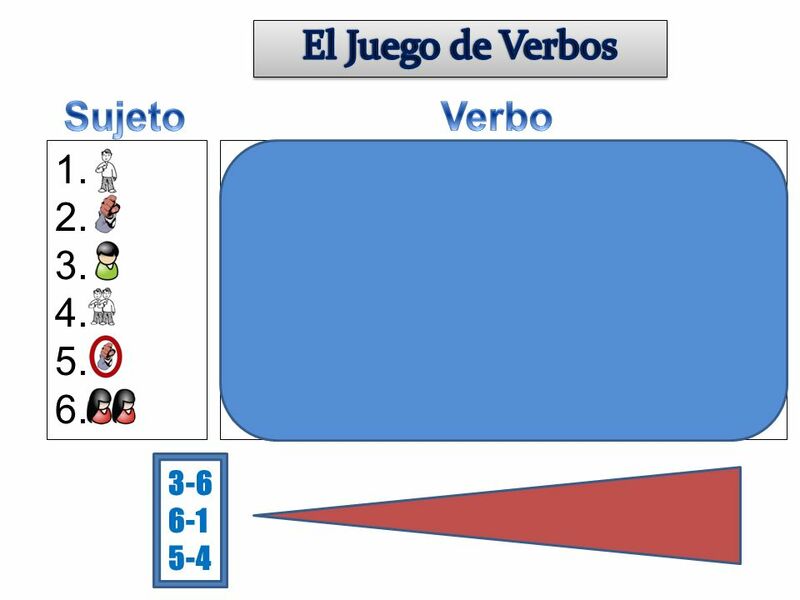 Set-Up and Play: This is a great activity to get students saying (or writing) complete sentences with correct verb. A partir de un verbo Los Verbos Regulares en AR. 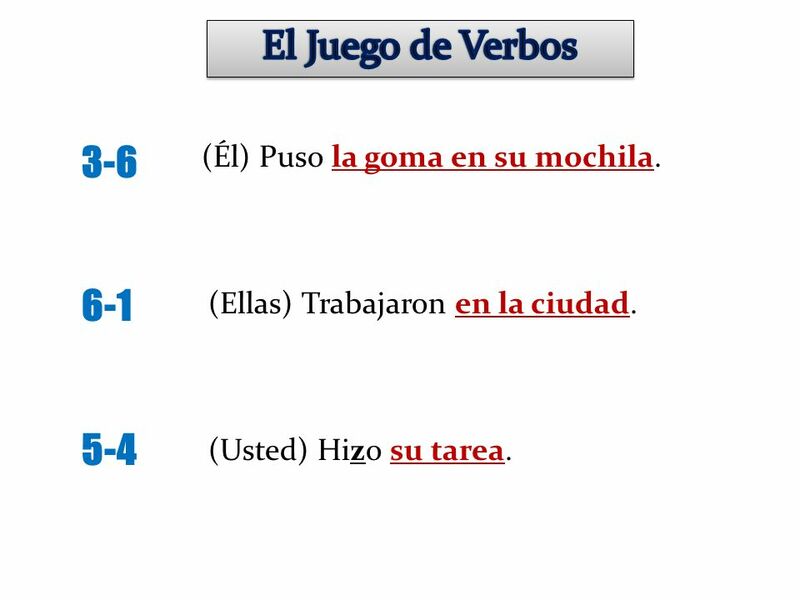 Irregular Preterite Verbs Page 31 – Chapter 1 Realidades 3. 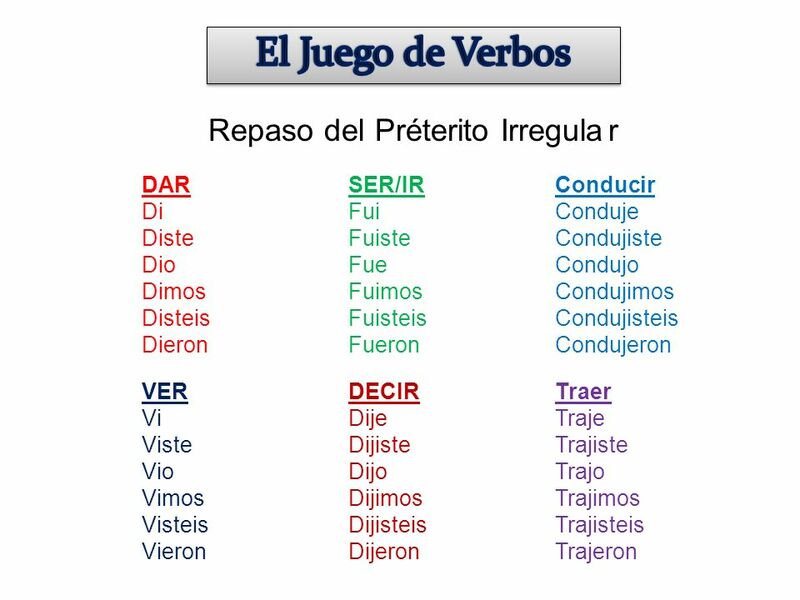 Irregular Preterite Verbs Unit 3, lesson 2. 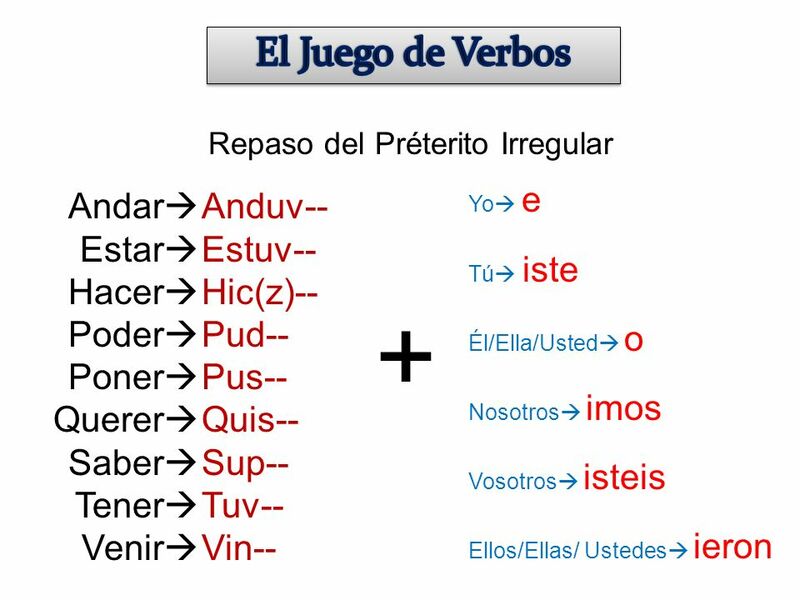 Irregular Preterite Verbs Happen in the past, over and done with. 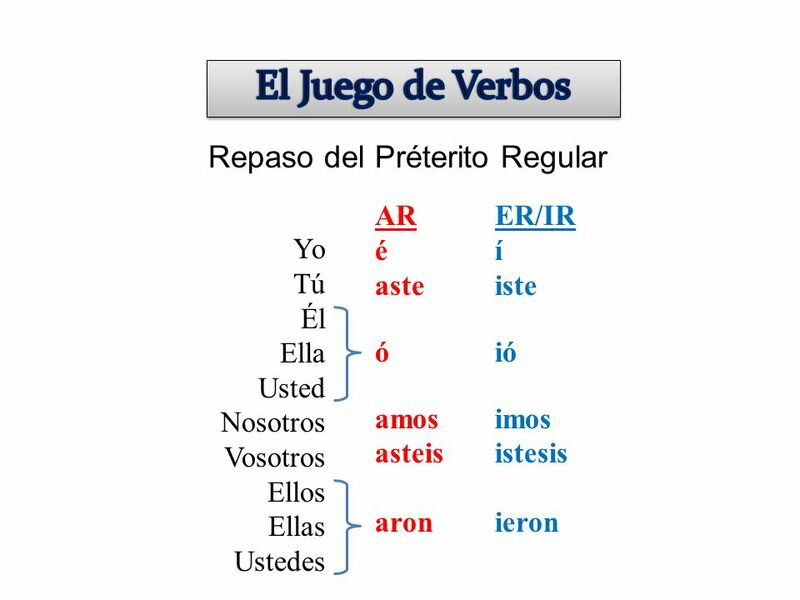 There is a whole set of irregular preterite. El Imperfecto. 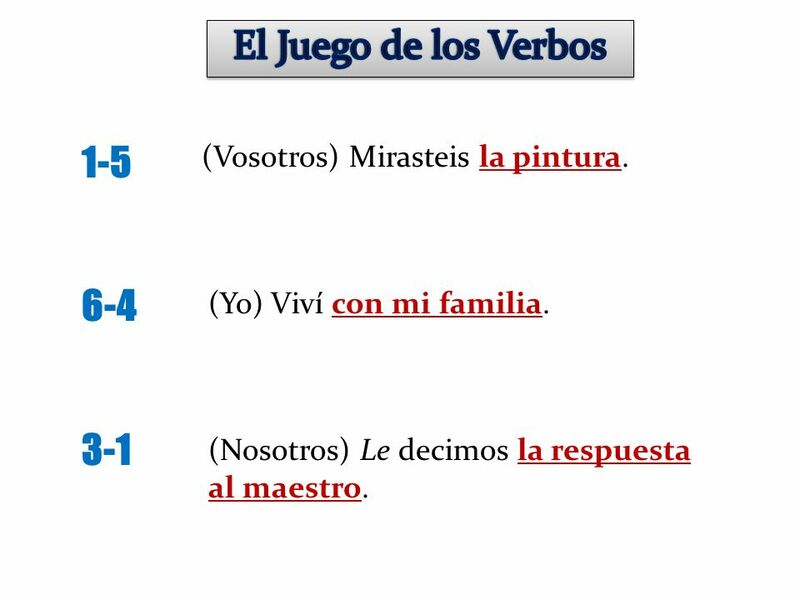 Set-Up and Play: This is a great activity to get students writing sentences with correct verb forms that has them demonstrate that they. Mirar Ella miró Juguemos con los verbos. 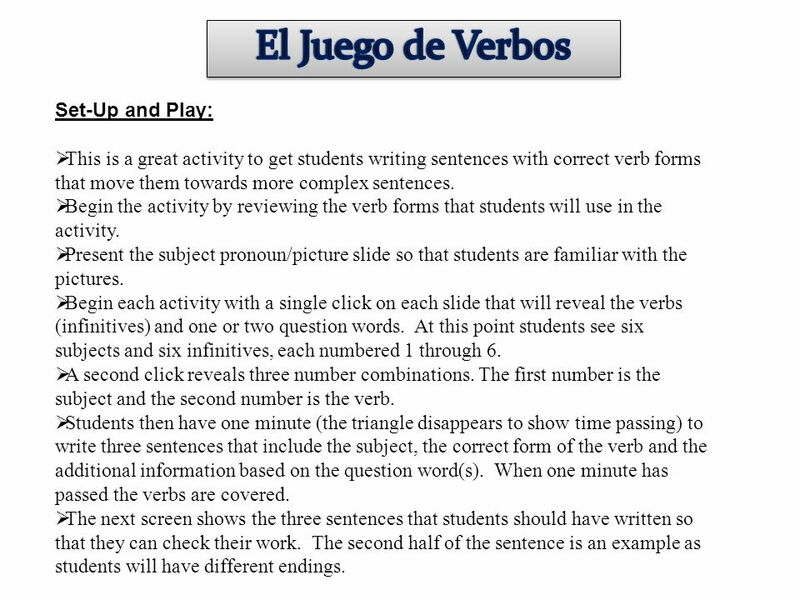 Set-Up and Play: This is a great activity to get students writing and practicing verb forms. Begin the activity. Verbos Regulares La Forma Correcta. 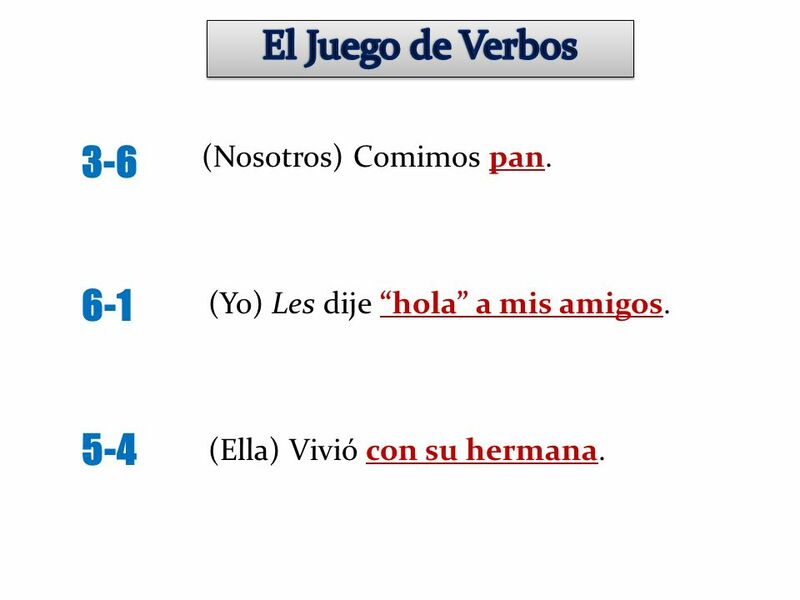 Set-Up and Play: This is a great activity to get students saying (or writing) complete sentences with correct verb. El Pretérito Regular La Forma Correcta. Set-Up and Play: This is a great activity to get students saying (or writing) complete sentences with correct. El pretérito: verbos irregulares La Forma Correcta.